Description: When Charlotte Sawyer is unable to contact her step-sister, Jocelyn, to tell her that one her closest friends was found dead, she discovers that Jocelyn has vanished. When her uneasy alliance with Max turns into a full-blown affair, Charlotte has no choice but to trust him with her life. For the shadows of Jocelyn's past are threatening to consume her—and anyone else who gets in their way. Why I Picked This Book: I always enjoy a Jayne Ann Kretnz book and this one looked intriguing! 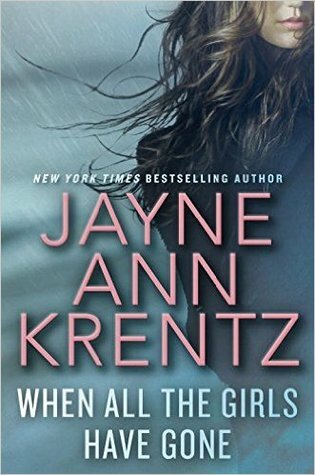 My Impression: One of the good things about a Jayne Ann Krentz book is that I always know what I'm going to be getting. It's going to be a good story with lots of suspense and a bit of romance. It's not necessarily the kind of mystery that will hold up under scrutiny after I've finished it but it's always one that will keep me reading to find out what happens next. This book did not disappoint on any of these levels. Let's start with the characters. I liked Charlotte right away. She's tougher than people give her credit for - especially her world weary stepsister Jocelyn - but does struggle with standing up for herself. She and Jocelyn are very clsoe but at times does feel herself rebelling about how Jocelyn tries to take care of her and protect her. She's also intelligent, incredibly compassionate, and cool headed when needed. No one questions how tough Max Cutler is. A seasoned profiler tirned PI he has his own baggage to work out but doesn't have a chip on his shoulder about and truly wants to do the right thing. The other characters aren't particularly flehsed out but are easy to keep track of who is who. 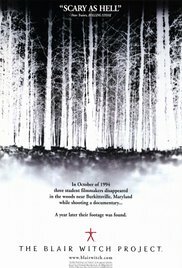 The mystery is interesting if somewhat predictable with an occasional twist and turn. At times I felt like it got overshadowed by the romance aspect but it never got lost completely. I liked how Max and Charlotte worked together and it was interesting to see how the investigation worked. I really liked that he treated her like a partner and listened to her suggestions even though she was a novice when it came to crime. While they don't quite fall into insta-love category they do have a very quick connection but I didn't find that particularly unrealistic since they suited each other so well. I loved the way all the different subplots wrapped up and would really love to see another book with one of Max's brothers as the main character. They're an interesting read. While the focus on the personal kept this from being super suspenseful it was still fast paced and I enjoyed it. If you're looking for a light entertaining read to keep your mind off the incoming holiday craziness this one would be a great choice! - side note: while there are some darker subjects covered (abuse and sexual assualt) they weren't described in particular graphic detail. I wouldn't call this a cozy but it's not a double check your locks kind of book either. Would I Read More of this Series/Author? : Absolutely! These are always fun reads if not entirely perfect. Would I Recommend this Book? : If you enjoy romantic suspense this is a fun book! This week the Top Ten Tuesday topic from the Broke and the Bookish is A Holiday Gift Guide freebie. Lately I've been really enjoying children's fiction so that seemed like the natural genre to focus on today! We've just come to the end of this age with the Tornado and I miss it! These picture books are so fun to read out loud and great for little ones just learning to read themselves. While there are tons of great books I'm leaving out (like anything by Mo Willems) these are some of our absolute favorites. 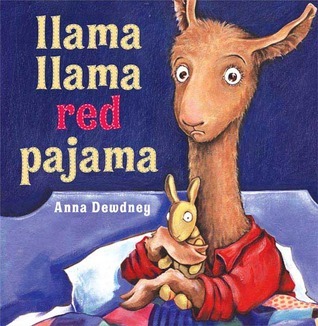 Llama Llama Red Pajama by Anna Dewdney - This was one of those accidental library finds and by the time we'd had it a week I'd ordered our very own copy. We ended up with almost all the other Llama Llama books the original will always be my favorite! There's also a Llama Llama stuffed animal which makes it extra fun. Sheep in a Jeep by Nancy E. Shaw Illustrated by Margot Apple - I have this book memorized and the illustrations are wonderful and there's always a surprising new detail to be discovered! The Color Kittens by Margaret Wise Brown - This was actually my book when I was little and the Tornado discovered it in a box my mother had given me and promptly fell in love. The illustrations are lovely and the book itself is a delight with lots of talk about color combinations, images to entice the imagination and adorable mischievous kittens. It's a great bedtime book! For me this age is all about the chapter books. Right now we are reading them aloud a chapter at a time but I'm sure soon he'll be reading them on his own. 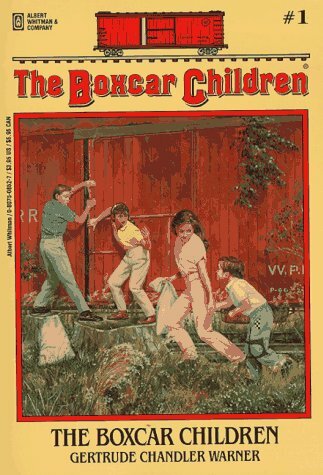 The Boxcar Children by Gertrude Chandler Warren - These were some of my absolute favorite books as a child and when I started reading them to the Tornado a year or so ago he promptly fell in love. The idea of the kids being out on their own and completely in control is a concept that appeals to most kids I think. While I like the older stories better then new more modern books the new books have less stereotypical gender roles. This is a series that appeals to both genders which is always a great thing. Geronimo Stilton series by Geronimo Stilton - When Eleanor was a little girl these were her absolute favorite so when the Tornado was ready for chapter books these were high up on my list of books to look for and he LOVES them! While they are chapter books there are lots of pictures and the books really make use of different fonts to add visual interest. Plus, the stories are just hilarious and there's a ton of them to choose from. The Magic Treehouse series by Mary Pope Osbourne - This was the series that turned Emma into a reader and the Tornado loves them too. I love that both children have their own skill set and strengths and weaknesses. As well, with all the topics covered it's easy to find one that will interest just about any child. Encyclopedia Brown series by Donald J. Sobol - I was thrilled to discover this series in the library both when I was a little girl and when the Tornado was starting to look for chapter books. Each book is essentially a collection of short stories with each one featuring a different mystery. Most of the time the solution can be discovered by paying attention to the details but if you're not not sure the solution is in the back of the book. Perfect for the early mystery lover! Gone-Away Lake by Elizabeth Enright - While I discovered Enright's delightful Melendy family as a kid but I didn't discover the Gone-Away Lake series until I was an adult and if I could add one book to my childhood bookshelf it would have been this one because it's absolutely wonderful. The idea of having an entire summer to explore all these abandoned mansions under the rather relaxed supervision of 2 people who could tell stories of the former inhabitants sounds absolutely magical. Since that's not likely to happen this book is close as you can get to the adventure without the risk of falling through the floor of one of those abandoned houses! This is kind of a difficult age for giving books as preferences are really starting to develop. I'm always amazed by the YA section in bookstores or at the library now. When I was that age the options were so much more limited (not that I'm terribly old!) 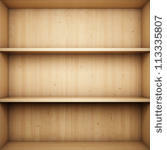 I started reading adult books around this period because there just wasn't a huge selection of anything else. Now it's just amazing what there is. These are two of my favorites - one old and one new! 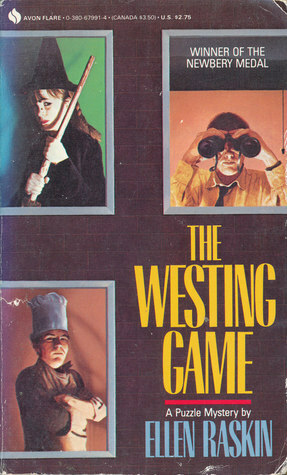 The Westing Game by Ellen Raskin - This weird little mystery was probably the closest thing I read that qualified as YA and I can't even begin to count how many times I read it! I loved the mysteries and the puzzle aspect of the book. Emma discovered it when she was probably 11 or 12 and fell in love with it as well. It's surprisingly undated for being published in 1978 though I think readers now would be a bit puzzled why everyone is so excited about the plush carpet and other decor items that aren't so much the thing anymore! Lockwood and Co: The Screaming Staircase by Jonathan Stroud - This is the new book but is just as odd and just as good though a bit darker than the previous book. In some ways this is basically the Boxcar Children with a much higher probability of dying and lots more ghosts. The kids are smart and brave and entirely on their own battling ghosts and keeping the world safe. While I think most kids 9 and up would enjoy this (though maybe not right before bed) it's also great reading for adult as well. What books would you give to the children in your life? Why I Picked This Book: It was on one of the display shelves at the library and looked interesting. My Impression: Going in I knew absolutely nothing about this book or the series so I had no idea what to expect. Judging from the cover and the blurb I was thinking it would be more of a Middle Grade story and was a bit puzzled by the fact it was puzzled by it being filed as YA - until I started reading it that is. There are a lot of very serious topics discussed - suicide, depression, death of a parent, grief, growing up and just not fitting in - and the book was definitely not the light romp I had the impression it would be. I did like how the subject matters were treated. Nothing was dismissed and at no point did I feel like the girls' feelings were trivialized however there was a wider perspective and Gilda and Juliet found a lot to admire about each other even when they didn't get along. I think 5th grade and up would be fine with the subject matter. Gilda is a bit of an interesting character. I think she read pretty true as 13 year old girl. Everyone around her is growing up and she's not quite sure she wants to start being interested in boys and makeup and all that stuff. She's also struggling to come to terms with the death of her father 2 years earlier and the changes in her world. Gilda is a bit immature and has a very in your face attitude which while not aggressive or mean does get annoying at times and she is definitely not a character everyone will enjoy. The mystery element is intriguing and while not all questions were answered I was satisfied with the way the story resolved. This was an entertaining book that tackles some very sensitive issues sympathetically and realistically. While I think Gilda's at times abrasive personality will not be for everyone I'm looking forward to seeing where the series goes next. Would I Read More of this Series/Author? : I would. I'm curious about where the series will go and the 2nd book had much better reviews. Would I Recommend this Book? : Yes, if you enjoy Middle Grade or YA with quirky characters I think you'd like this one. I hope everyone had a fantastic week and a wonderful Thanksgiving. This week hasn't gone quite as expected but has ended up being okay. Last Saturday my Grandfather who I have mentioned several times fell and broke 2 vertebrae in his neck. Thankfully I was able to head down there to help out and have been there since then and it looks like I'll be here at least this coming work and possibly the week after. He's doing very well though his mobility is a bit limited and at 92 any period of immobility is concerning. However, his stability is improving rapidly and he's having an easier time getting around every day. I'll be trying to visit you guys as best I can but my online time is severely limited right now. I am still getting some reading done and hopefully will keep posts going up regularly. I'm looking forward to catching up with everyone as soon as I get back and see what everyone is reading! Check out the sidebar to see what's going on here. 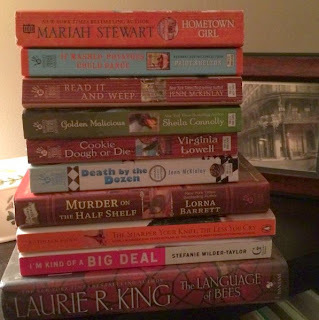 I had a Rambling from the Stacks about books that are good but just don't work for you on Monday and Tuesday I posted the Top Ten Books I'm Grateful For on Tuesday and the newest book by one of my favorite historical romance author on Wednesday. Have a fantastic week and happy reading! **I fully intended to have the November edition of my 52 Pins in 52 Weeks feature but I was called away by a family emergency and will be away from my computer (and my kitchen to attempt the various pins) for a little while. I hope to have the belated November Edition up in the next couple of weeks. Until then here is a review of a new-ish classic from Mary Stewart. Why I Picked This Book: Back in college I read a number of Mary Stewart books and enjoyed them but found I remember very little. I'm not sure I ever read this one as I was limited by what my used bookstore had available (this was pre-Amazon!). 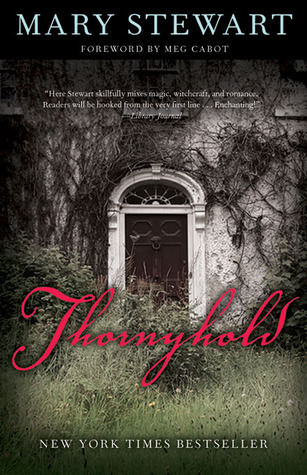 When I was looking for a Mary Stewart to read this one appealed to me because the blurb reminded me a little of one of my favorite books - The Witch by Barbara Michaels - and I loved the cover. My Impression: When we first meet Gilly she is a little girl living a very lonely life and my heart just breaks for her. She's desperately trying for affection and attention but her efforts basically amount to her throwing herself against a brick wall. She isn't abused in the technical sense but the lack of empathy and sensitivity on her mother's part and the inattention from her head in the clouds clergy father make for an unhappy home life. Luckily, there is Cousin Geillis who blows into the story like a modern day fairy godmother. She isn't around very much but her impact on Gilly's stark life is huge and becomes even more so when Geillis dies and leaves the now orphaned adult Gilly a home and comfortable living. This isn't an action packed book but somehow it kept me turning pages and engrossed in the story. There aren't any moments where I was holding my breath in terror but at the same time there was always a feeling of unease lurking in the corners. I loved Gilly, William, and Christopher and Hodge is definitely a cat I'd like to meet! From the time Gilly takes up residence at Thornyhold we are just as in the dark about what's actually going on as she is. I didn't know who to trust and was that feeling of fear just in Gilly's mind or was something going on? Is there something sinister lurking behind the smiles and friendly faces of the neighbors. I was surprised to see that Thornyhold's original publication date is 1988. There is an old fashioned feel to it and the attitudes of the characters for me would have placed the book being published decades before. Overall, this is a delightful read. It isn't a long book but the story feels fully fleshed out and came to life as I was reading. Would I Read More of this Series/Author? : Absolutely! I'm looking forward to see where Stewart takes me next. Would I Recommend this Book? : If you're in the mood for a short book that's got a good dash of sweet but doesn't drift into sappy this is a good pick. If you're a Mary Stewart fan don't hesitate to pick this one up for a read or a reread. Description: A Gentleman of Leisure is a comic novel dedicated to Douglas Fairbanks--who starred in the film version; in Hot Water, J. Wellington Gedge is the man who has everything--but finds himself caught in a series of international events. Summer Moonshine involves a complicated love quadrangle and what is probably the ugliest home in England; and Carry On, Jeeves is a collection of stories in which Jeeves the charge and a familiar bevy of individuals appeal to him to solve their problems. Why I Picked This Book: I had heard about Jeeves but knew almost nothing about him. This seemed like a fun way to get to know the characters. 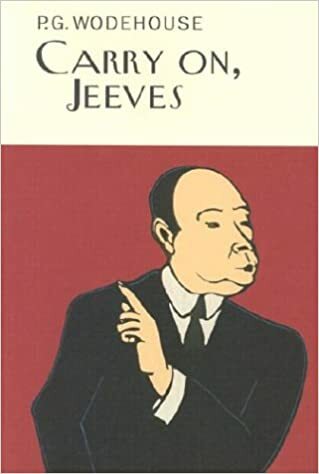 My Impression: Jeeves is one of those characters whose name is so much a part of the vocabulary that I can't quite say where I first heard about him. But to be honest I didn't know much about him other than that he was the quintessential butler. I've been wanting to read P.G. Wodehouse for sometime as his name is frequently mentioned with the name of some of my favorite authors such as Agatha Christie. So I was thrilled to discover that my library happened to have an audio of Carry On, Jeeve and I downloaded it immediately. It wasn't quite what I expected - I think I expected more mystery but what I found was an absolute delight. This volume consists of 7 short stories where poor Bertie is drug into one calamity after another while trying to help his friends. Bertie always means well but the results lean towards the disastrous but luckily Jeeves is there to unobtrusively right the ship. This short volume was originally published in 1925 and while the surroundings definitely come from that time period the language is so fresh and light that it doesn't feel dated. It was really a fun book to listen to and one that I was sad to see end. I definitely see building a collection of Wodehouse in my future. I think Jeeves would be the perfect character to run too for some comfort reading. My only complaint with this book was that the stories didn't really seem to connect together and didn't seem to have a connected timeline but while I might have liked it slightly more that way I thoroughly enjoyed this book and am anxious to read or listen to more. Martin Jarvis did the narration on the edition that I listened to and I thought he did a fantastic job. His voices felt spot on and I loved the contrast of Jeeves deeper calm almost monotone voice to Bertie's much more animated sometimes to the point of flustered voice. Would I Read More of this Series/Author? : Absolutely! Especially if I could get any of the other stories in audio. This was an absolute delight. Would I Recommend this Book? : I would. I think most readers would enjoy these stories. Happy Thanksgiving to my American friends and happy Thursday to those elsewhere. I hope where ever you are it's a lovely day full of fun, good food, and generosity of spirit. I had a post about what all we were doing planned out but as usual the best laid plans and all that bit. We had a bit of a family emergency last weekend and I am staying my grandparents (with the Tornado which is definitely adding to the fun) to help until things get straightened out. Thanksgiving is going to be a bit of a slapdash affair but everything is so much better than it could be so I have a lot to be thankful for. I hope everyone has a wonderful Thanksgiving and a wonderful day! Description: To root out the card cheat responsible for her brother’s death, Miss Delia Trevor spends her evenings dancing her way through high society balls, and her late nights disguised as a young man gambling her way through London’s gaming hells. Then one night, handsome Warren Corry, the Marquess of Knightford, a notorious member of St. George’s Club, recognizes her. When he threatens to reveal her secret, she’s determined to keep him from ruining her plans, even if it means playing a cat-and-mouse game with the enigmatic rakehell. Why I Picked This Book: Sabrina Jeffiries is one of my absolute favorite historical romance authors and this is a series I've really been enjoying. Okay, well I really liked the first one but somehow haven't read the second one but I LOVE the concept of the series so same thing right? 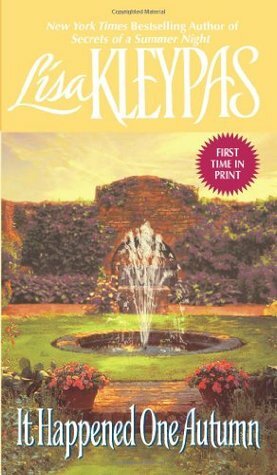 My Impression: Jeffries is absolutely one of my favorite romance authors and this book did nothing to change my opinion on that. I was pulled into the story almost at once and I fell in love with the characters immediately. Delia is a delightful main character. She's intelligent and driven and so straightforward in her manner that she's impossible not to like. I loved that she went out of her way to dress unattractively in order to scare off potential suitors because they would only be in her way. At the same time she has her insecurities though she tries to hide them by sticking to her mission of helping her family. Warren is also a likable guy. He comes off as fairly relaxed and interested mostly in having a good timed but there is definitely so much more to him. Due to something that had happened to his cousin he has become aware of the vulnerability of women in this time period and is a gentleman to the core. He and Delia have a lot in common in their focus being more on taking care of others than on worrying about themselves. Their interaction is brilliant and while the relationship proceeds very quickly it felt like they were so connected that it didn't really bother me. The plot itself is fast moving and why at times I was a little fuzzy on just what Delia planned to do her focus made sense. I very much enjoyed getting to know both of them and see as little by little they learned to lean on each other instead of always being someone else's support. Overall, this is an entertaining read with heart and I always love how Sabrina Jeffries always brings her characters to life. This was the 3rd book in the series and while I haven't read the 2nd one I had no problem jumping in here as the focus is completely on Delia and Warren and other than a concern for the rights of women there is no continuing story line. Would I Read More of this Series/Author? : Absolutely! I'm looking forward to going back and reading book 2 and will be keeping an eye out for anything else from Jeffries. Would I Recommend this Book? : Definitely! If you enjoy historical romance this is a book you shouldn't miss. It reminded me a little of Julia Quinn's The Viscount Who Loved Me though it's a tad bit darker. 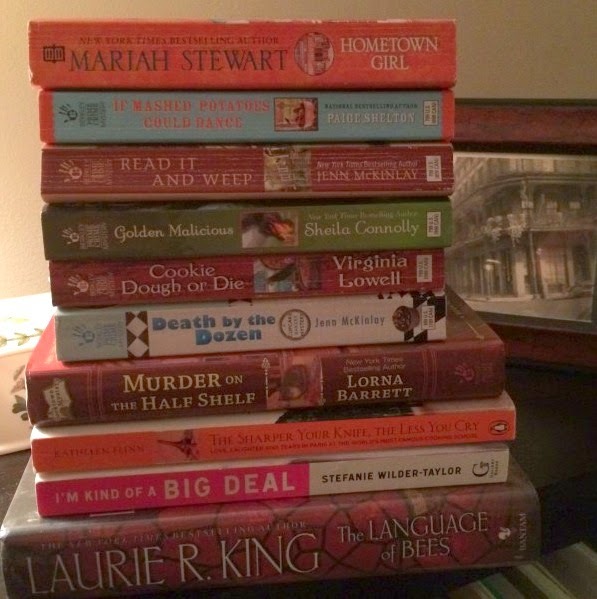 This week's Top Ten Tuesday topic from The Broke and the Bookish is a Thanksgiving Freebie. My take on this topic this year is the Books that I'm Thankful - books that have somehow been pivotal in my life for whatever reason. 1. 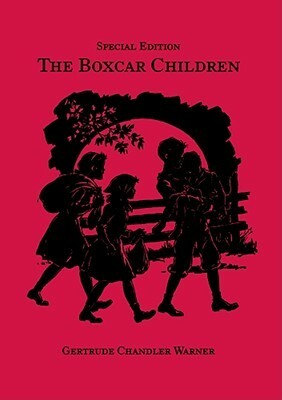 The Boxcar Children by Gertrude Chandler Warren - This was the first series that really captured my imagination. I loved how resourceful the kids were and how they were always solving mysteries and having adventures. This series has kind of come back around and there are a ton of new books that are modern but they didn't come out until well after I grew out of the series. These books have gotten extra special lately because they've become the Tornado's favorite books to read at bedtime. 2. The Secret of the Old Clock by Carolyn Keene - This was the first real mystery series I ever read and I remember searching the shelf at the library for ones I hadn't read. Later on I was fascinated to learn that Nancy Drew was the first of the more adventure stories that were written just for girls as they hadn't existed prior to Nancy arriving on the scene. I thought it was interesting to see too that at the time the books were first published (1930) it was not typical to see a girl in her late teens not only being as independent as Nancy but also not portraying her as someone more focused on more of a career than a future as a wife and mother. Plus, I just love the cover art! 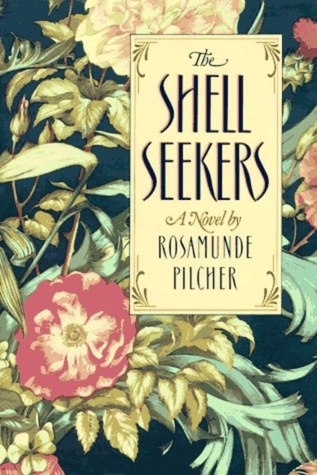 3 The Shell Seekers by Rosamunde Pilcher - This was pretty much the first adult book that I ever read that wasn't a classic and I think I reread it a few times a year for more than a decade - each time getting something a little different out of it than I did the time before. I read through the binding on three different copies. It's also really the first book that I enjoyed that my Grandmother did as well starting off a conversation about books that is permanently ongoing. I don't read it as much as I used too and I don't think it would make it into my top ten favorites anymore but it'll always be special. 4. Cruel and Unusual by Patricia Cornwell - This was the first adult thriller I ever read and it scared me half to death in the best possible of ways. I went on to read her other books until around 2000 or so when I realized that I was no longer enjoying where she was taking the story. I still remember that feeling of holding my breath while I waited to see how it would all work out. 5. 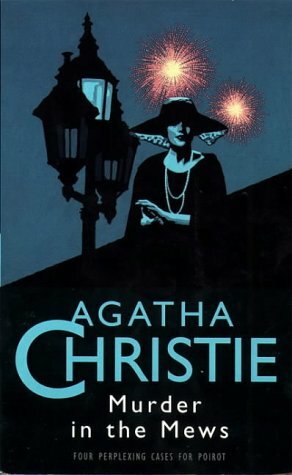 The Secret Adversary by Agatha Christie - This was the first Agatha Christie I fell in love with. Prior to that while I had enjoyed the ones I read they hadn't really stuck with me. Then I discovered Tommy and Tuppence's first adventure and I fell completely under her spell! 6. Devil's Bride by Stephanie Laurens - I was very anti-romance for a long time before a friend (Lisa from Books Lists Life) challenged me to try one. This is the first one I read and I loved it and it opened up a whole new genre to me. I reread it not too long ago and didn't think it stood up well to a reread but I loved it at the time. 7. The Mother Tongue: English and How it Got That Way by Bill Bryson - I was reading this book when my husband and I had just started dating and when I mentioned it to him he expressed such interest that when I saw another copy of the book at a used bookstore I bought him one. We had a good time discussing this one together. 8. Southern Living: 30 Years of Our Best Recipes - When I got married I couldn't cook at all. Either my husband would cook or we'd go out to eat ever single night. The first summer he was out of town for a business trip that ended up being several weeks and the fact that I could do nothing to feed myself other than go through a drive-thru began to irritate me. I was reasonably intelligent - surely I could figure out how to cook something. This book kind of saved the day - not only being full of recipes that looked good but being simple enough that as a complete novice I could attempt them with mostly successful results. 9. The Four Story Mistake by Elizabeth Enright - This was one of my favorite books as a child and when my Mother was moving I discovered my copy among a number of other books. I took it home and reread and then discovered a tiny little sentence that I had never noticed before - Part of the Melendy family series. With the help of Amazon I quickly acquired the rest of the books and it's what really made me reconsider picking up children's literature again which is now one of my favorite genres. 10. The Happiness Project by Gretchen Rubin - When I picked this book up I was in a big memoir phase and this one seemed like my kind of book - until I discovered it felt much more like self-help than a memoir. I'm not a big self-help fan and I almost put it down because what do I need help for? Reading this book was fascinating. Yes things are good but am I as happy as I can be? Am I needlessly putting off stuff that will make me happy or be fun for the family in favor of doing what I feel like I should? This book caused me to reevaluate how I was doing things and I think my whole family has benefited from that. I started this year with the goal of reading outside my comfort zone. I haven't made as much progress as I initially expected to because it turns out that before I can be sure I'm actually reading outside my comfort zone I have to figure out what it is. This took some thought as I'm not a particularly introspective person so it was a bit of a challenge! I don't read YA. I definitely don't read YA that has a romantic focus. I don't read books that center on illness because I don't like to cry. But I had seen some really great reviews on this one and the main character is bookish so I plowed ahead. I can definitely see why there were so many glowing reviews on this book. It's impossible not to like Madeline. She's smart, she's brave, she's nice, and she's very mature for someone who is so sheltered and protected. I loved her relationship with Gloria and with her mother though that one was a bit more bittersweet. Olly is completely swoony. He's sweet, he's smart, he's funny in a fantastically snarky way, he's in a tough situation but isn't a complainer. He's really an amazing character. The plot was interesting and I enjoyed learning about "Bubble Baby Syndrome". I easily identified with both Maddy and her mother. Something about this didn't work for me. I found I was resisting actually listening to it and while I was listening to it even though I was enjoying the story I kept checking to see just how much I had left. I found myself bargaining with listening time. If I would listen to an hour I didn't have to listen to it for the rest of the day. It wasn't that I even particularly disliked it it was just that I didn't want to listen to it anymore. Part of this could have been that I was listening to the book instead of reading it. There were a lot of schedules and IMs and other things that may have helped this click more for me if I had read it. Bahni Turpin is the narrator and while I would have no problem listening to other books she narrates for me her voice seemed to adult for the character of Maddy. Also, there were times when Olly's voice was read by a male narrator and other times when Turpin did his voice. For some reason I found that incredibly distracting. So what am I trying to say? This ended up being a book I went back and forth between 2 stars and 3 stars when I was rating it. I finally went with 3 because I don't think it was the book's fault that I didn't like it. There have been a number of times when reading a blurb or a book review where I've said "oh this isn't for me" but I think this is the clearest example of a book I've really read that really wasn't for me. Have you ever read a book that just didn't work for you even though you could see all the things that are really great about it? How do you rate a book that just isn't for you? I was hoping this week would be another empty mailbox week but I'm so excited about these new books it doesn't even matter. Plus, they're both 2017 releases so that doesn't count right? And don't even try to tell me that 2017 is just over a month away because I won't believe you. Reading: When All the Girls Have Gone by Jayne Ann Kretnz, Gilda Joyce: Pyschic Investigator by Jennifer Allison, and The Woman in White by Wilkie Collins which I'm enjoying but am not sure I'll ever finish! 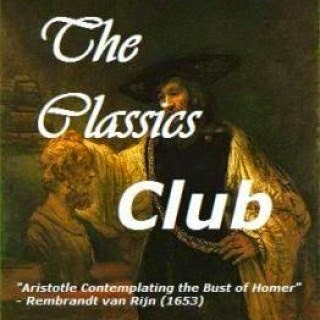 Listening: I finished Carry On Jeeves by P.G. Wodehouse this week which was a delight but decided not to download another book until next weekend. With Thanksgiving coming up I don't see having much time listen until all the craziness is over! Watching: I'm caught up on Blindspot so now need another show to stream when I'm cooking. J and I started watching Remington Steele on Hulu and are enjoying it Pierce Brosnan is such a baby when it was made and he plays the charming grifter to perfection! It's a bit dated (first season came out in the early 80s) but lots of fun! I've also really been enjoying Bull which has NCIS's (which is another favorite) Michael Weatherley and The Big Bang Theory. We had a fantastic visit with my Grandparents last weekend and I'm so glad I acted on the impulse to go. The Tornado and I spent most of the days playing outside with the dogs and exploring. We found a (very dead) baby copperhead which led to a rather interesting science lesson on how to tell a poisonous snake from a non-poisonous one and what the ribs of a snake look like. He was fascinated. We were both a little sad when it was time to go home. Thanksgiving madness has begun this week. The Tornado had a "feast" at school on Friday and all parents attended. It's always fun to see him with his classmates though it was basically a roomful of headache! 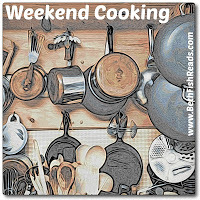 This coming week will be lots of planning and even more cooking. We do 2 Thanksgivings - 1 at my mother's house and the other with J's family that we host. It's always a lot of fun but I'm exhausted by the end of it all. Now that the 3 older kids are out we've been reorganizing and slowly working or redoing their rooms and Thanksgiving kind of snuck up on us! Two of them have their own places but Emma will be staying here overnight which means we have to do some rearranging to get a place for her to sleep! 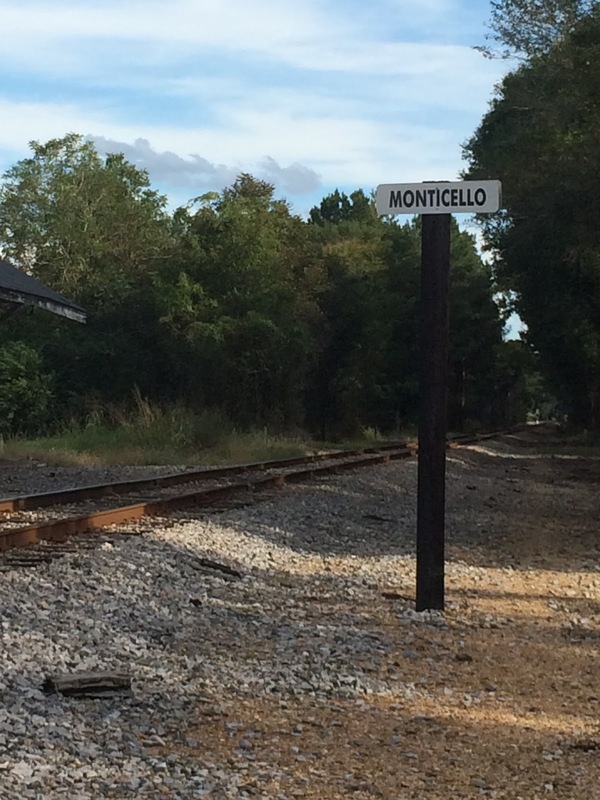 I'm going to guess that none of you have heard of Monticello (pronounce the c like an s), Mississippi. There really isn't a reason to have heard of it. It's a tiny town - population as of 2010 was 1,571 in the southern part of the state, 1 county away from the Louisiana state line and on the banks of the Pearl River. In 1951 the Women's Club in Monticello published a cookbook called The Monticello Hostess. It's one of those cookbooks that I worry are dying out. The kind where everyone in the group contributes recipes that used to be everywhere but I don't see as often as I used too. When the Tornado and I were at my grandparent's this past weekend I discovered my Grandmother's much loved copy of The Monticello Hostess. 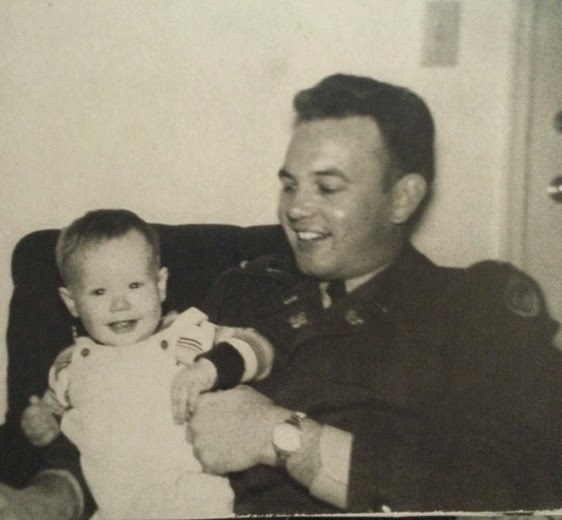 In 1954 my Grandfather, a full time National Guardsman, was put over the station there. In some ways I think it was a fairly idyllic time for them. 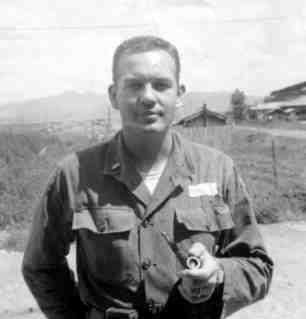 His deployment to Korea was behind them, they had two young children and after a few years of living hundreds of miles away from their families they were now within 100 miles of almost everyone. My grandfather, a pilot, was spending a lot of time flying to different Guard stations and my Grandmother was getting involved in all the organizations the little town had to offer which included The Women's Club which is why 60 + years later her copy is sitting open on my desk. We had a good time giggling over some of the recipes. The enthusiastic use of gelatin is somewhat terrifying. Who knew that tuna and gelatin belonged in the same dish (and we're not going to talk about the Molded Salmon Salad)? And just what is a yeast cake that's mentioned in a number of bread recipes? How does that translate into what I can buy at the store now? And what was even more interesting was the stories behind the names listed just below the the recipes. I learned that all the Rhymes girls were good cooks and that Lynda Rhymes Clay had boys who were about the same age as my uncles which then led to a rather hair raising story involving half a dozen barefoot little boys, a rifle (hoping it was at least a BB gun) and a rather irritated snake. That any recipe by Mrs. Bufkin is worth trying though other than this book she never would share her recipes. That any recipe that came from Anita (whose last name I'm not mentioning!) was bound to be inedible and whole hosts of other stories about the characters who inhabited this little town. One thing I found and really enjoyed about this book is that as long as I avoid anything involving gelatin the recipes really aren't particularly dated. They're fairly simple, everything is from scratch and while some have a bit more fat than we tend to use today I have to wonder if it isn't all better for you than the cookbooks that might have half the fat but rely on can of whatever soon or other pre-made ingredients. Today I'm sharing a recipe for Hot Potato Salad which was made by a Mrs. Sara Izard Hough who my Grandmother remembers nothing about. Wash potatoes and steam until tender - about 30 minutes. Peel and slice. Fry bacon until slightly browned, and then add onion and brown. Blend salt sugar, flour, mustard, and pepper and add to the onion and bacon. Add the vinegar and boiling water and cook until smooth and thickened. Add the potatoes and heat through until moisture has been partly absorbed. Add parsley and serve hot. My Results: I think I will be trying other recipes from Mrs. Hough as this was a very good classic Hot Potato salad. It was just enough bacon and onion. It was a little low on tang so I think I might change the proportion of vinegar to water - maybe 8 tablespoons vinegar to 4 tablespoons water and maybe add a little dijon mustard to up the mustard-y factor. With those changes I can see this being my go-to potato salad! Would you take a book with you when you go to your family's Thanksgiving gathering/dinner? It depends. If I was staying overnight than I absolutely would but if I was just going for the day I wouldn't. At least with my family Thanksgiving is always a bit of a madhouse and I always end up rushing around helping finish up last minute details. I might bring a book for the Tornado to keep him occupied but not one for me. 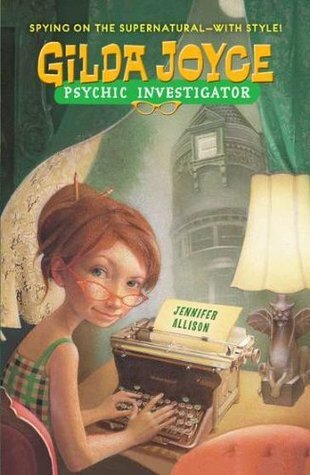 This week's book is Gilda Joyce, Psychic Investigator by Jennifer Allison. This was one of those random library pickups that happen sometimes. It was on the endcap and I liked the title plus I've been feeling pulled towards Middle Grade fiction lately. I've read the first chapter and so far I'm enjoying it. It's definitely on the younger end of the young adult spectrum and Gilda really does come off as a typical preteen. Looking forward to seeing how the story develops! 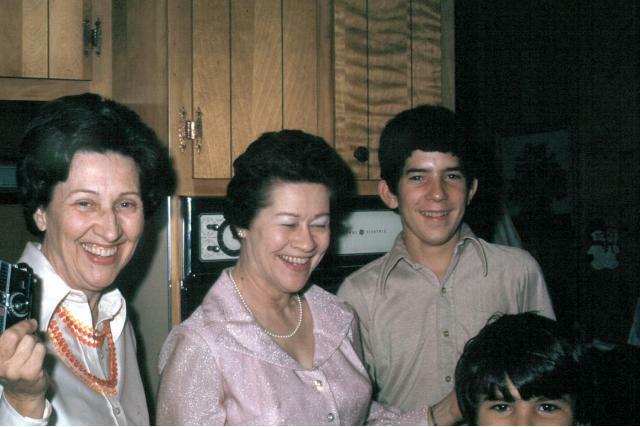 In the back row of Mrs. Weinstock's eighth-grade English classroom, Gilda Joyce chewed on a lock of her dark hair and pretended to listen as her classmates described their plans for the summer on the last day of the school year. I think I'd probably zone out too. A whole classroom full on 8th graders discussing summer plans one after the other sounds like it could drift into tedious! Dad: Sorry, kiddo. I got here just in time to meet him, but we decided not to wake you up. I'm not here yet so I don't know exactly what's going on but this is a transcript of Gilda's memories and this one is about Santa Claus. Gilda isn't buying her dad's explanations! This is a bit of an unusual pick for me so I'm curious to see what I think of it. I know the later books in the series seem to have been better received. What do you think? Keep reading? Description: Lauren Gabriel spent many years of her childhood in foster homes, wishing her mother would come back for her and be the family she needs. Now twenty-years-old, she still longs for a place that she can truly call home. Her work as a cashier is unfulfilling, and at Christmas it’s unbearable with the songs and carols and chatter of Christmas that she hears throughout the day. Why I Picked This Book: I love Christmas books and it's so rare to find one that it's a romance that I couldn't resist! My Impression: I love a good Christmas story and one of my absolute favorite things about them isn't the romance which is the focus of so many but the warm and fuzzy feel goodness of the background story. 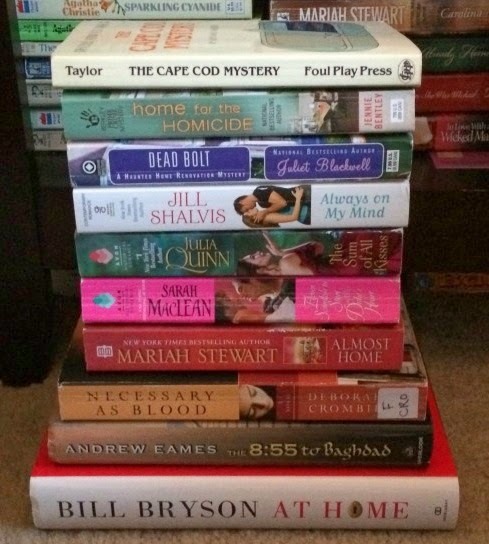 This is a little different than a lot of the Christmas books staring at my from my bookshelf because it isn't a romance though there may be a tiny touch or two sprinkled through out. On the warm and fuzzy scale this is about level with the last 20 minutes of It's a Wonderful Life - you know the part where George goes home and people start pouring in and unless you're hanging out in another famous Christmas story with a heart 3 sizes to small you have happy tears in your eyes. It isn't quite as exuberant as the end of the movie but it delivers on warm Christmas feelings and seeing good people truly rewarded. I really liked Lauren. She's had a rough start and while she has some issues she isn't damaged or traumatized - she's just alone and desperate for family that she's never been able to find. She's smart, funny, and vulnerable with just enough optimism that I didn't find it unrealistic though maybe a little improbable. 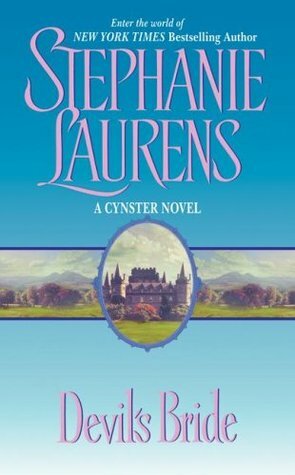 While the book focuses on Lauren it's also full of characters all with their own warmth, their own struggles, and their own secret wishes and I felt like I really got to know all the characters from major ones likes Stacy and Gloria to Les the grocery store manager and Holly the waitress. 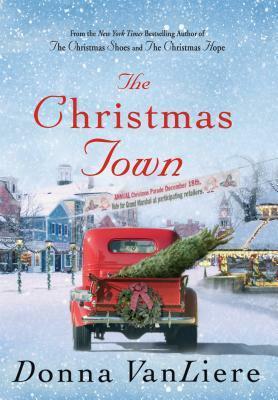 This is the very best of a Hallmark movie in book form and has me ready to start pulling out the Christmas goodies. If you're looking for a light feelgood read with plenty of heart to put you in the Christmas spirit you can't go wrong with this one! Would I Read More of this Series/Author? : Absolutely! I was pleased to see my library has another of her books and I'll be keeping an eye out for future releases. Would I Recommend this Book? : I would! If you're looking for a Christmas-y read I think you'll enjoy this one. The author of Rice, Noodle, Fish now celebrates the delectable and sensuous culture and cuisine of Spain with this beautifully illustrated food-driven travel guide filled with masterful narration, insider advice, and nearly 200 full-color photos. Grape, Olive, Pig is a deeply personal exploration of Spain, a country where eating and living are inextricably linked. Crafted in the "refreshing" (Associated Press), "inspirational" (Publishers Weekly) and "impeccably observed" (Eater.com) style of the acclaimed Rice, Noodle, Fish, and written with the same evocative voice of the award-winning magazine Roads & Kingdoms, this magnificent gastronomic travel companion takes you through the key regions of Spain as you’ve never seen them before. Matt Goulding introduces you to the sprawling culinary and geographical landscape of his adoptive home, and offers an intimate portrait of this multifaceted country, its remarkable people, and its complex history. Fall in love with Barcelona’s tiny tapas bars and modernist culinary temples. Explore the movable feast of small plates and late nights in Madrid. Join the three-thousand-year-old hunt for Bluefin tuna off the coast of Cadiz, then continue your seafood journey north to meet three sisters who risk their lives foraging the gooseneck barnacle, one of Spain’s most treasured ingredients. Delight in some of the world’s most innovative and avant-garde edible creations in San Sebastian, and then wash them down with cider from neighboring Asturias. Sample the world’s finest acorn-fed ham in Salamanca, share in the traditions of cave-dwelling shepherds in the mountains beyond Granada, and debate what constitutes truly authentic paella in Valencia. 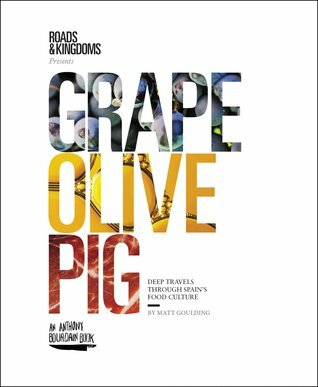 Grape, Olive, Pig reveals hidden gems and enduring delicacies from across this extraordinary country, contextualizing each meal with the stories behind the food in a cultural narrative complemented by stunning color photography. Whether you’ve visited Spain or have only dreamed of bellying up to its tapas bars, Grape, Olive, Pig will wake your imagination, rouse your hunger, and capture your heart. I have yet to visit Spain but I feel a little like I've had a fly over visit after reading Grape, Olive, Pig and I really feel like the food and the people behind it came alive in these pages. While Spain has been rising rapidly on the list of my Places I Must Visit list I don't think I ever really had a clear idea about the food or the difference between the regions. The book is divided by geographical regions and Goulding throws himself into each chapter showing the wonder and unique culture of each cuisine. Goulding's love of Spain itself comes through clearly in the pages and I enjoyed the insight into the Spanish attitudes on food. The photographs are gorgeous and many made my mouth water. This is the perfect book if you're going to Spain soon, have been to Spain and want to relive it, or just really want to go. It's a whirlwind tour of food and wine and fascinating stories put forth in a well organized and engaging format. I thoroughly enjoyed it and this will be a book that lives on the shelf ready for the occasional flip through for quite some time - in between hunting down some excellent Spanish cookbooks so I can get a taste of what Goulding describes. Matt Goulding is editor and cofounder of Roads & Kingdoms, the former food editor of Men’s Health, and the coauthor of the New York Times bestselling series Eat This, Not That! He is a James Beard Award winner and has also written for Harper’s Magazine, the Wall Street Journal, the New York Times, Food & Wine Magazine, and Time magazine. He divides his time between the tapas bars of Barcelona and the barbecue pits of North Carolina. Follow Matt on Twitter. 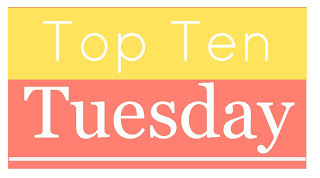 This week's Top Ten Tuesday topic from The Broke and the Bookish is a movie freebie. Confession time - I'm not really a movie person. I don't hate them but I tend to not pick watching a movie or going to a movie when there are other options so coming up with a topic was a bit of a struggle! However, while I'm not necessarily the biggest movie fan there are a few things that I've picked up along the way during my movie watching. 5. Handguns are either shockingly accurate or impossibly inaccurate. There is no in between. (Pretty much any action movie). What have movies taught you? Description: In the aftermath of her financier husband's suicide, Emma Shay Compton's dream life is shattered. Richard Compton stole his clients' life savings to fund a lavish life in New York City and, although she was never involved in the business, Emma bears the burden of her husband's crimes. She is left with nothing. 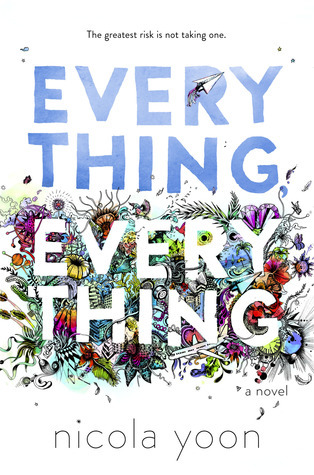 Why I Picked This Book: I loved the idea of the plot and Emma's character. We watched a documentary on Bernie Madoff not too long ago and I was fascinated by what happened with his family. 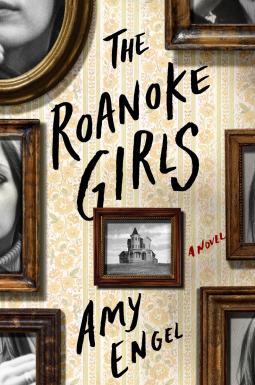 This seemed like a great fictional way to explore that role - plus I've really enjoyed Robyn Carr's other books! My Impression: I was really excited going into this book but was curious as to how Carr would handle a very complex issue. This kind of fraud is not unfamiliar to most of us and while Bernie Madoff did seem to be the one that has gotten the most attention there were countless others. The stories of the victims always made me so incredibly sad and it was impossible not to understand their anger as people realized that they or their parents had lost everything to further someone's greed. Even before Emma Shay got tangled up with Richard she had a tough time of it with an at best uninterested and frequently vindictive stepmother and a betrayal from people she really thought she could trust. I love that Emma is really beginning to understand herself as the book progresses. I couldn't help but feel sorry for her but at the same time she isn't a character that reaches out for pity and I found myself admiring her way of just continuing on far more than I felt sorry for her. The relationship between Emma and Riley and Emma and Adam felt very natural. Things aren't easy but they're not overly angst-y either and there is always a touch of humor at just the right time. While I haven't read nearly as many of Robyn Carr's books as I'd like I've really enjoyed what I've read and this I think was probably my favorite. While there is a romance don't let that keep you from reading it if you tend to not enjoy books in that genre. There is so much more here - strength, endurance, courage, and forgiveness all in an entertaining page turner of a book. 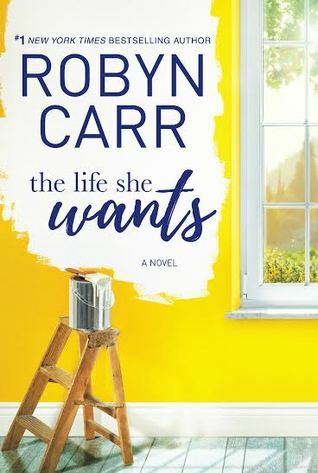 If you haven't read Robyn Carr yet I think this would be a great one to start with! A: Money can be fun but it’s a tool, nothing more. There are so many wise sayings that apply – “It is a wealthy man who knows he has enough.” Or one of my favorites, “If you marry for money you’ll earn every dime.” Why? Because money is a convenient tool but the love of money is soulless. When Emma is finally free of the burdens and complications of wealth, when she earns her money and simplifies her life she feels richer. I think one has a rich life when one has people who love her, friends and hopefully family, or at least the family one collects, when one has health and a positive outlook on life. Some of the happiest people I’ve known didn’t have much material wealth. Real wealth comes from knowing who you can depend on, who you can trust, who will be there for you when you need someone – maybe just to talk. I know that billionaire romances are very popular but I’ve never been enamored of them. I find the problems of the incredibly rich to be boring and lifeless. There’s joy in challenge and I take pride in hard work. In a job well done. People are not important to me if they’ve amassed wealth – they’re valuable to me if they’ve collected wisdom. Professor Cornel West said he didn’t necessarily admire intelligence – Hitler was brilliant after all. He admired wisdom. Q: Throughout the novel, we see Riley thriving as a self-made businesswoman, while Emma finds a great deal of satisfaction and community in a job that she may have once considered menial. What role does meaningful work and self-sufficiency play in each woman finding the life she wants? A: To me it’s obvious – you’ll never take pride in something given to you. You’ll take pride in earning something. You’ll take pride in deserving your wages. In fact, the harder the work the more meaningful the reward. You can positively ruin a child’s life by giving them everything – let them do the work so they feel accomplished. Bored children do poorly in school, that’s why they put them in gifted programs. They take money that’s given to them for granted and waste it, but if they build it they’ll protect it, save it and guard against its waste because it was challenging to achieve it! Work is one of the most meaningful parts of living. It doesn’t matter what kind of work, it just means effort and accomplishment. You don’t have to be a surgeon to be valued by society! I really appreciated a clean public restroom and it’s pretty easy to tell if the person responsible took pride in their work. I grew up being told no job was too menial. I raised my children to find work they loved, something they could take pride in. They both did hard jobs from young ages. It’s good for us. Q: The concept of forgiveness is important throughout the book, and several of the characters struggle to find ways to forgive each other and themselves for past mistakes. Why do you think forgiveness is so crucial to happiness, and why do you think it sometimes takes people such a long time to forgive? A: I think the idea of forgiving is not only crucial, asking for forgiveness is even moreso! Who among us won’t forgive if someone makes sincere amends? Most of what has to happen to patch up a tattered relationship is admitting you’re wrong and asking to be forgiven. Forgiving in a vacuum doesn’t change much but what everyone wants to hear from someone we think wronged us is a real apology. We can say we forgive a hateful person, we can say that gives us peace of mind, but if that person goes on being hateful, we’ll keep experiencing the pain of it. In the case of Emma and Riley, they both made serious mistakes. I knew what it was going to take for them to get each other back. What I didn’t know until the whole story played out was whether they would do it. Q: You’re known for your fantastic book series—at every event you do people beg you to write more Virgin River and Thunder Point books! Does this novel have any characters that you want to explore in future books? If not, what was it like working on a self-contained story like this, and how does writing a standalone novel differ from, say, writing the first book of a planned series? What I love about the standalone is that a specific set of challenges has been overcome and there should be satisfaction. Now the rest of their lives belongs to the reader and the reader’s imagination. Q: We have to ask, what’s next for you? What are you working on right now? A: I’m at work on the second Sullivan’s Crossing novel, no title yet. It should be ready soon and out the beginning of April 2017. NOTHING! Seriously - not one single book! I'm actually pretty excited because I really needed an empty week. I do have a few pending requests and a list of books I want to get that's about a mile long but I managed to bring nothing new into the house. Now I just have to see if I can manage to get caught up on the ones I have. Listening: I finished the Moonraker by Ian Fleming (so good!) earlier this week and am planning on starting Matilda by Roald Dahl tomorrow. Watching: Lately I've been catching up on Blindspot which is entertaining but doesn't quite pass the "oh this makes sense" test. I've also been catching up on NCIS and it's franchises. Next weekend we're probably going to watch Moonraker which I'm a little nervous about. 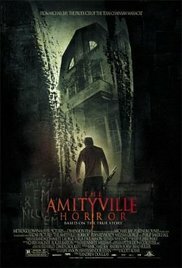 I loved the book but I heard the movie is terrible so it'll be interesting to see what's different. I'm betting most of it! The Tornado had Friday off of school for Veteran's Day so on a whim we took off Thursday to head down to south Mississippi to spend some time with my favorite veteran - my Grandfather who is a WWII/Korea veteran. I'm writing this on Wednesday but it's safe to say we're having a good time. I'm a little nervous because this is the first time on a trip where it's just been the Tornado and me. J has missed a few of the trips but I usually have at least one of the older kids with me. It's been a fairly quiet week around here - or the half of the week so far. We spent all weekend last week cleaning and de-dust miting the bedroom and we did just about everything on the tip sheet (except replacing the carpet with wood - that will take a bit!) so hopefully it's helping. My eyes are definitely a lot less itchy and I'm sleeping better but it's also November and things seemed to have stopped blooming or dying or whatever that puts out the stuff that makes everyone sneeze! Between some internet issues and being out of town I've been a no show but I'm looking forward to catching up with everyone as soon as I get back! Description: Four young ladies enter London society with one necessary goal: they must use their feminine wit and wiles to find a husband. So they band together, and a daring husband-hunting scheme is born. When Marcus shockingly—and dangerously—swept her into his arms. Lillian was overcome with a consuming passion for a man she didn't even like. Time stood still; it was as if no one else existed... thank goodness they weren't caught very nearly in the act! Why I Picked This Book: While I've reread the next book in this series several times I wanted to revisit this one where we first really get to see St. Vincent at his worst. My Impression: It's no secret that Kleypas' Devil in Winter is one of my favorite books. St. Vincent is one of the few villain to hero conversions that I actually believed. But I didn't really remember the book where St. Vincent became a villain in the first place. When I was picking a few books to reread this year this one jumped to mind. This is the second book in the Wallflower quartet where 4 women who are outcasts for various reasons become friends. In this book we don't see much of the friendship though the other women are around. The book really focuses on Lillian and Westcliff's growing relationship. These two bicker and drive each other crazy and it's a whole lot of fun to watch. Westcliff is super responsible, intensely logical, and tightly controlled and it's driving him crazy that this outspoken American is constantly on his mind. The switch of the relationship from irritation to love is very quick but it works. The reader sees what's going on well before they figure it out. I loved. Seeing more of Westcliff's sister Olivia and it really made me want to go back and read her story. Lillian is an interesting heroine. She's intelligent and outspoken and struggling to remember all the rules in the much more regulated English society. I've always been fascinated by the waves of American heiresses who were sent overseas in order to marry a title so I really enjoyed this fictional account. And St. Vincent is such a charming villain! While this isn't my favorite it was a really enjoyable read and makes me even more excited to reread Devil in Winter! Would I Read More of this Series/Author? : Definitely! Kleypas is one of my favorite historical romance authors. Would I Recommend this Book? : If you enjoy romance than Kleypas is an author you shouldn't miss! 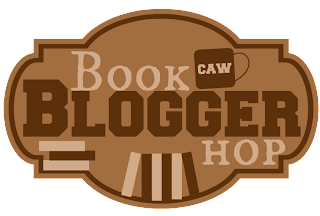 Are the giveaways on your blog publisher-sponsored giveaways or giveaways of your own books? I don't do a lot of giveaways because I worry about dropping the ball on it and never actually completing it but several of the blog tour companies I work with do giveaways where you just have to include the rafflecopter link so I do always include those. This week I'm back to Agatha Christie! It's been a few books between this one and the last one and I'm starting to miss her! This week's book is Murder in the Mews which is actually 3 novellas. Agatha Christie does the best short stories and novellas and while I've read this one before I remember NOTHING about it. I'm really looking forward to settling down with this on. The flat was a modern one. The furnishings of the room were modern, too. The armchairs were squarely built, the upright chairs were angular. A modern writing table was set squarely in front of the window and at it sat a small elderly man. I love that despite the short sparse sentences I still have a very clear idea of what this flat looks like! One of my favorite things about Agatha Christie's books is there's always a character who is so calmly resigned to whatever chaos is going around them and it's usually an old Colonel - normally one who has spent most of his life in India. Description: Golden peonies bowing their heads beneath blue delphinium bells. Delicate pink anemones threaded between freckled green orchids. Soft apricot roses woven together with velvety purple irises. Every bouquet tells a story. And every story begins at Blossom & Grow, a tiny jewel-like flower shop in the heart of Dublin. Here, among the buckets of fragrant blooms, beneath the flickering candles and lanterns, Lara works her magic. Translating feelings into flower arrangements that change hearts and lives. But what about her own heart? Has she really healed since she lost her chance to be a mother? What will happen when her own story takes a sudden turn? Can the flowers that heal the customers work their magic on the florist? 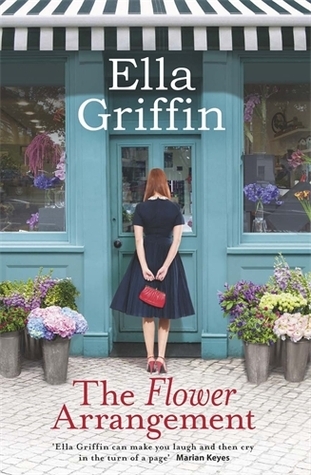 Drawing together a delightful cast of characters, Ella Griffin brings her warmth, wit and wisdom to a captivating tale woven around a Dublin florist. Why I Picked This Book: Between the setting in Dublin and the cover how could I resist? My Impression: This book was not at all what I expected from the cover and the blurb. I was expecting a fun story about Lara with some heartwarming elements and maybe a a tear or two. There were definitely heartwarming elements and there were definitely tears though both were in higher numbers than I expected them to be. I don't know if I would call this story fun and while Lara is a main character she is definitely not the focus. Instead the focus is on the flowers and how they touch the lives they appear in. We see Lara with her struggling marriage, her hidden devastation, and the flower shop she pours everything into. We see her father, her brother, and her customers in there lowest and their highest moments and into their most personal moments. I had a few issues with this one. For starters it took me awhile to get used to all the head jumping. Each chapter change always pulled me out of the story a little before I was able to get back in. I'm not sure exactly what happened but I would become very aware for two paragraphs of each new chapter that the writing was in present tense. After a minute or so I'd forget all about it and be back in the story but it was a little jarring. I also didn't feel like the book really takes place in Dublin. Other than the occasional reference of the currency it could have been any city anywhere in the world - or least one where it snows sometimes. However, the things I enjoyed about this book definitely outweighed the minor issues. While this isn't the fun lightweight book I expected this book and these characters will stay with me for a long time. I do a lot of my reading in the carline waiting to pick up my son and there were a number of times I had to switch books so I didn't start openly weeping because the emotions and the characters just felt so real. While Lara was my favorite I also enjoyed Phil's character and Katy's whole family. Really I could talk about each and every person I met through this book with feeling. Some of them I liked and some of them I really didn't but each one felt real and their stories made me connect with them, sometimes I laughed, sometimes I cried, and occasionally I rolled my eyes a bit. Overall, this was an emotional read that I was completely drawn into when reading it. It wasn't perfect but it's one that will stay with me for quite some time. Would I Recommend this Book? : I would! I think most fiction readers would enjoy this.